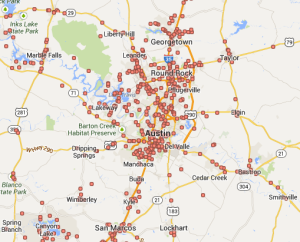 If you're looking for Austin storage auctions, you need not look any further. 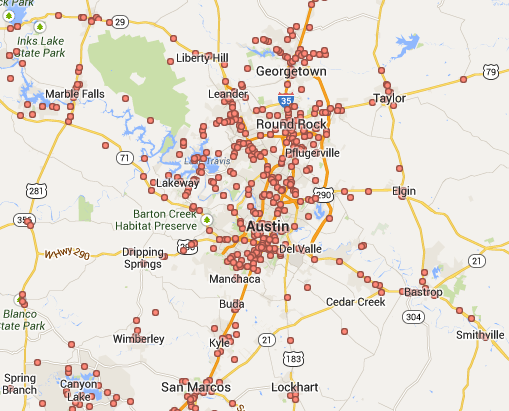 We publish the auction schedule for every storage facility in the Austin area. On average, we list over 100 storage auctions every month including auctions that you can't find on any other websites. Click on the image to the right for a map of our coverage area. Our call center contacts over 400 storage facilities, twice a month, in order to provide you with the most comprehensive schedule available. All of the information is organized into an easy to read, PDF format, which allows you to print out the entire schedule with one click of a button. The facility above is selling restaurant equipment, antiques and a safe. The facility above is selling a rifle, a tool chest, antique fishing poles and a flat screen TV. The facility above is selling music equipment. The facility above is selling a 2005 Dodge Ram and a 1999 Bass Tracker boat, outboard and trailer. The storage auction schedule provides you with the name, address & phone number of the storage facility, the time and date of the storage auction and the number of units scheduled for public sale. Auctions that are likely to have fewer people in attendance are listed in bold print. If there are any unique or valuable items visible inside the unit, we list them below the auction. Once you become a member, you will receive instant access to the auction lists you'll get our e-book, The Storage Auction Pro, absolutely free. 14 storage facilities are having an auction this week in the Austin area. Click the button below to get started.